I've been rearranging the entire house, shifting pieces of furniture from one room to another. 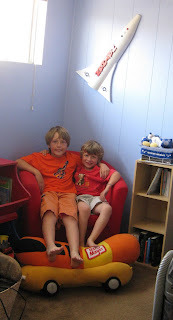 I moved a small bookcase from the dining room and a comfy red chair from living room into a corner of the boys' room so they could have a cozy little nook to read in. Nathan was responsible for putting their books on the shelves and he totally blew me away by putting them in alphabetical order by title (this is something that Michael and Benjamin do, Nat and I tend to arrange things by how they look). Then they tried it out, together! 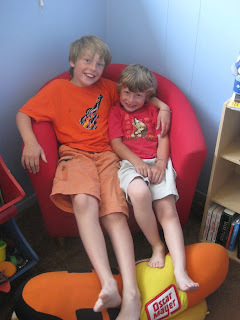 They grabbed our giant Oscar Mayer plush Wienermobile (which we received as a gift when Nathan was born) and used it as a footrest, and then spent several hours reading. It's been several days and every day I find one or the other of them curled up in the chair, looking all cozy, curled up with a book. Why did I not think of doing this sooner?